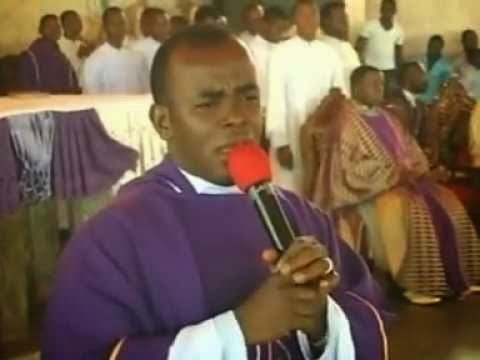 Ohanaeze Youth Council has defended fiery Catholic priest, Rev Father Ejike Mbaka’s recent controversial statements on the 2019 general election which has drawn wide condemnations in some quarters, according to The Nation. Mbaka had on Sunday predicted doom’s day for President Muhammadu Buhari and the Presidential candidate of the PDP, Alhaji Abubakar Atiku, saying that none of them would win, without mentioning the eventual winner. He also criticized the Peoples Democratic Party, PDP, Vice Presidential flag bearer, Peter Obi for not doing anything for his church despite his support in the past while he was governor of Anambra state. Mbaka’s statements have drawn widespread criticisms from Nigerians who accused him of selling his blessings to the highest bidder. But in a statement on Tuesday in Abakaliki the Ebonyi state capital, after its meeting with 49 affiliated groups in the South east, OYC argued that the Spiritual Director of Adoration Ministries’ statement were in order. The statement was signed by Comrade Obinna Achionye, Deputy President General, Ohanaeze Ndigbo Youth Council worldwide, Rev Bobby Ezemonye , Chairman of all Youth leaders, Dr Helen Ogbonnaya President, South East Women Professionals, Mr Chidera Uduocha, President, Igbo Students movement and Mazi Okemiri Alex, President, World Igbo Youth Council. The group while describing the attack on Obi as unfortunate and avoidable, urged the former governor to change his approach to campaign issues in other not to repeat the electoral loss of the PDP in 2015 when he was the campaign Director of the party for the entire Southern Nigeria. The Group said: “Ohaneze Ndigbo Youth Council Worldwide with her affiliated groups and Igbo groups insists that Former Governor Peter Obi and PDP Vice Presidential candidate’s embarrassment at Adoration Ministry during the annual Adoration Ministry baarzar at Enugu is unfortunate and avoidable but call on Obi to change strategy in approach to campaign issues so as not to repeat the electoral loss of 2015 Presidential election where he was the PDP campaign director for entire Southern Nigeria in which the South East produced poor results, and also the last Anambra election where PDP came a distant 3rd”. “The coalition of Igbo groups and OYC agreed that Rev Fr Mbaka’s fearless stand to both Peter Obi and Kano Gov Ganduje to send messages to Atiku And President Buhari is in order, and hail Sen Hope Uzodinma”. The group noted that it will make its stand on the 2019 election in January after Fr Mbaka’s new year prophesy on the 31st of December and after its negotiations with stakeholders and contestants. “We call for calm in this festive period and urge the security Agencies especially the military to be friendly with Ndigbo as we have set up machinery to assist the security Agents to curb crime and kidnapping during this period”.